Looking for a great deal on exciting games, rides and features for your corporate carnival-style event? You've come to the right page! From corporate annual family fun days to employee celebrations, Active Attractions have been the corporate event hire provider of choice for over a decade. We've helped hundreds of businesses to put on successful, memorable events, and we can do the same for your organisation too. 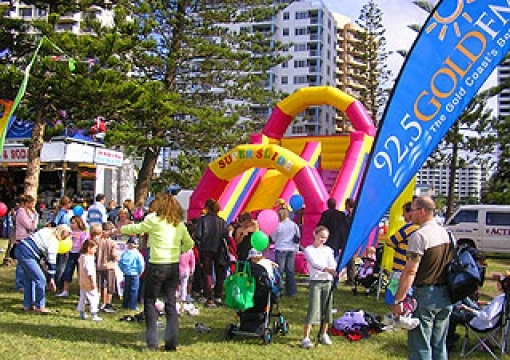 Our options include bouncy castles, slides, rides, sideshow games and arcade games. We can tailor a complete hire package to suit your needs, and are well equipped to cater to both adults and children. Putting on a themed party? No worries - let us put together the right combination of attractions to suit. Got limited space for the event? We can make sure that your guests have a great time, even if you don't have the floor/ground space to accommodate larger attractions. Active Attractions' corporate event hire services come complete with safe setup and a supervising operator - and for your peace of mind, we also carry $10m in public liability & general insurance. For more information, or to start planning for your corporate event hire requirements, call us on 1800 133 041. We’re happy to provide our corporate event hire in Brisbane, the Gold Coast and wider Queensland.